It is no longer enough to plan a nice color scheme with matching flowers and bridesmaids dresses, now your Wedding Day is an EVENT and needs a special theme like one of the Lands of Disneyland. Your theme could be inspired by your favorite Fairy Tale and shows like “Once Upon a Time’ , “Mirror, MIrror” or “Princess Bride”. Your dream wedding from your girlish childhood fantasies. Maybe even Disney is partly to thank for this Wedding Trend because they have a gorgeous line of Wedding Dresses created by Alfred Angelo that has been going strong now for several years with Princess inspired Wedding fashions and perfectly photographed Wedding party attire. According to a recent article in “Brides” magazine, themed weddings will continue to be popular with Nautical, Fairy Tale, Rustic and Rainbow topping the list. Members of the Wed Eclectic Team on Etsy.com are full of inspired ideas to compliment your Wedding Theme from Herbal to Vintage to Alice in Wonderland. Each shop has carefully created these find handcrafted items for your special day with as much love as if you made them yourself. Because we all know you don’t have time to do everything and enjoy your big day, so visit some of these shops for some creative handmade ideas. Rainbow Themed ideas can include a DIY Wedding backdrop like this alternative ceremony backdrop for those with serious DIY skills: This “chapel,” created by interior design studio ICRAVE, has layers of rainbow-colored ribbons hanging from the wire mesh ceiling of a framed cube. It would be easy enough for someone handy to put together this mesh and wire frame with supplies from the hardware store. A clever bride can inlist her flower girls and bridesmaids to tie on all the colorful ribbons. Invite wedding guests to enjoy in the fun and throw out these Rainbow Streamers as the Bridal couple leave the reception with these awesome hand rolled rainbow streamers with a wonderful array of colors. A rainbow colored bridal bouquet is a must and there are so many gorgeous ideas! I just love this idea with the peacock feathers instead of the usual flowers. Rainbow sprinkled cake pops from Simply Divine Desserts make perfect favors for guests and are so cute that they can be part of the table decorations too! 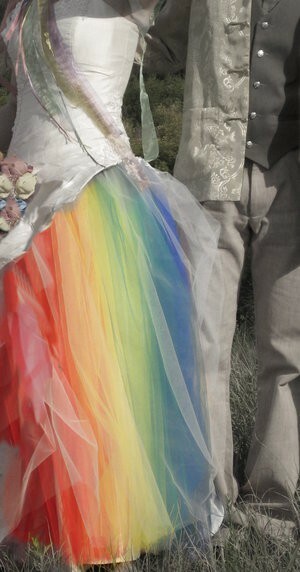 Rainbow Wedding Dresses? Yes, they exist. Here are a few of my favorites both crazy and wild. A bit on the Wild Side of the Rainbow, this dress has shredded tulle in a layer of color under the traditional white bodice. Besides letting the bridesmaids have a bit of fun with color, the groomsmen and groom can join in with different colored ties, hats, sneakers or shirts just to name a few ideas. This rainbow bow tie is very festive but not too wild. Go a bit over the rainbow with colored seat covers, table decorations and some fun invitations with your Rainbow Theme. This DIY Rainbow Wedding Invitation on Etsy is a digital file that you can customize and create on your own. You save money and get to have a perfectly colored invitation. Your little flower girls will love to wear a fun rainbow ballet style dress and join the fun, while you can let the ring bearer carry a rainbow inspired pillow, tie or something to tie him into the groomsmen. A Summer Wedding with this fun Theme can have brightly colored tents for the reception and so many wonderful flowers. Let your guests dine on fresh fruit and veggies in a variety of colors, arranged like a rainbow. 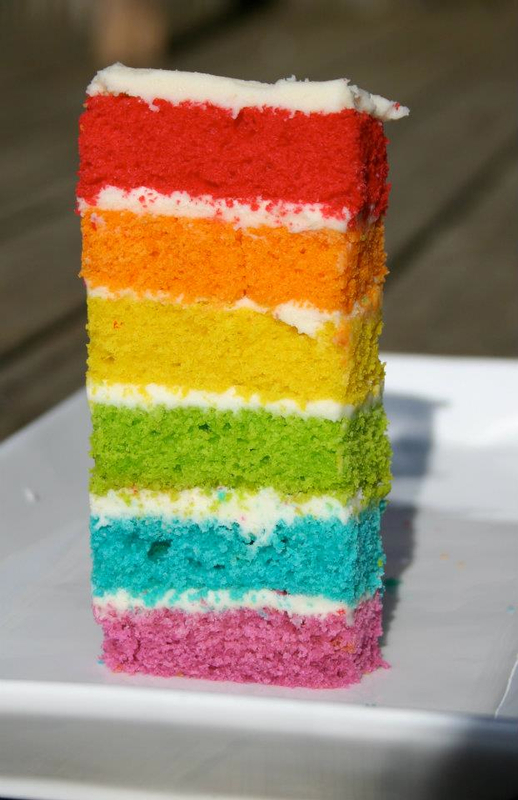 I really adore this layered Rainbow Cake Slice with six wonderful layers, each a different flavor. 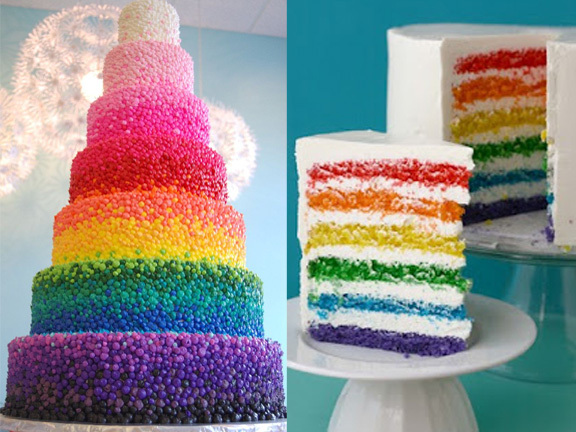 And to finish it off, a gorgeous pair of Rainbow Inspired cakes found on Pinterest Boards. 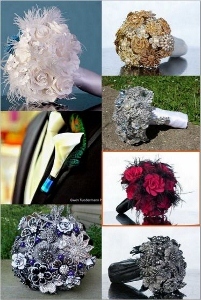 If you search on Etsy.com or Google Rainbow Weddings, you will find all kinds of fun ideas and photos to inspire you. Don’t forget to look at the tag ‘wedeclectic’ when searching on Etsy for members of the Team. 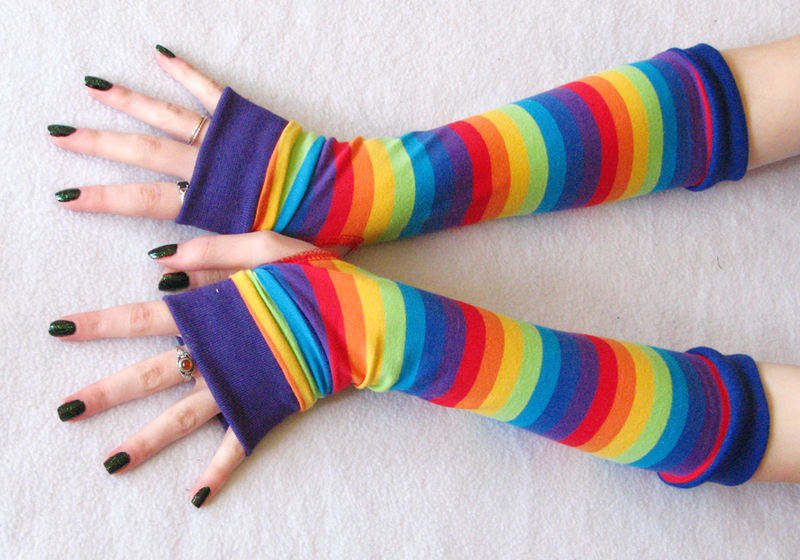 I end with my favorite Rainbow item from my own shop! Although I would not subject a bride to sporting these unless she plans to run a marathon right after! Getting married? You will want every item in this collection by Tammy Kowalczyk from FancyStrands; it’s gorgeous! 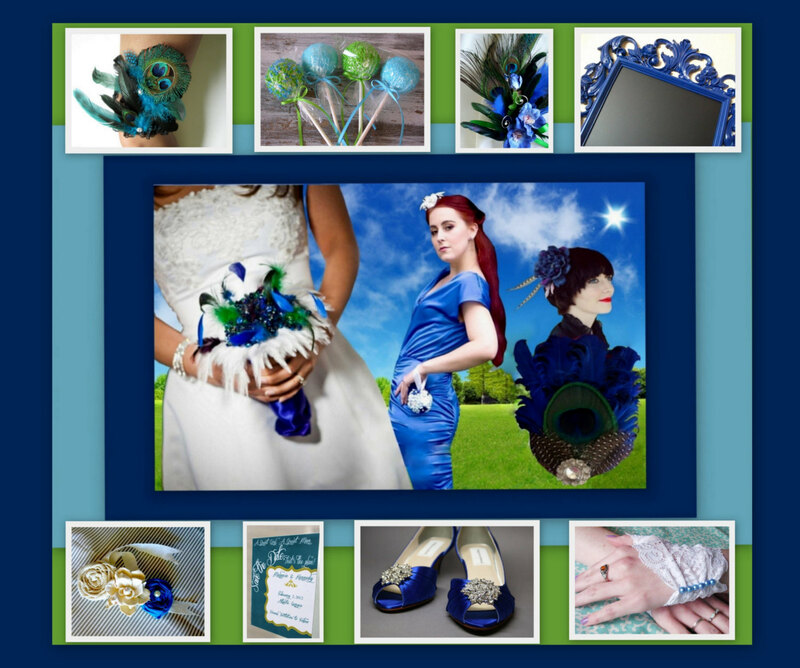 An inspiration board by PuppyCatMeow…everything you need for a spring wedding! What recommendations would you have in looking for a wedding planner? I would like to have a wedding planner that has pictures and good references. I would like a planner with a ton of energy. One who thinks out of the box. I like one-of-a-kind fun times. He/she will need to be able to travel & work like an interior decorator; customizing my wedding to my style, or lack there of :). I sort of had a wedding planner when I had my wedding at the hotel and I would recommend making sure you get a wedding planner who is willing to work with you and your ideas. Oh and make sure you are able to contact them easily whether it is by email or phone because you want that reassuring feeling that they are there. I had a tiny scare when my hotel wedding planner didn’t get back to me for 2 weeks! 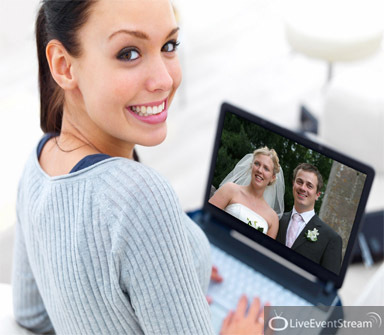 Think of your wedding planner as your best friend for that one day. As well as being professional because you are paying for their service, you must also be comfortable with them so take notes of your first impressions! Do you plan to hire a wedding planner, or plan your own wedding? If you had a wedding planner, what recommendations would you offer? 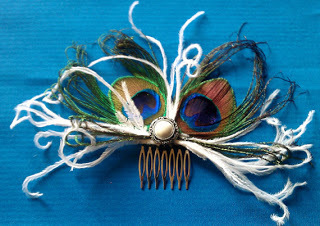 msformaldehyde is offering a peacock hair accessory on BlartBlog! Ends in 4 days! I cheated and used a pre made pie crust but you can make your own very easily. Grease a 10″ pie plate with butter. Pour in the mixture. Bake for 40-45 minute at 350°F. 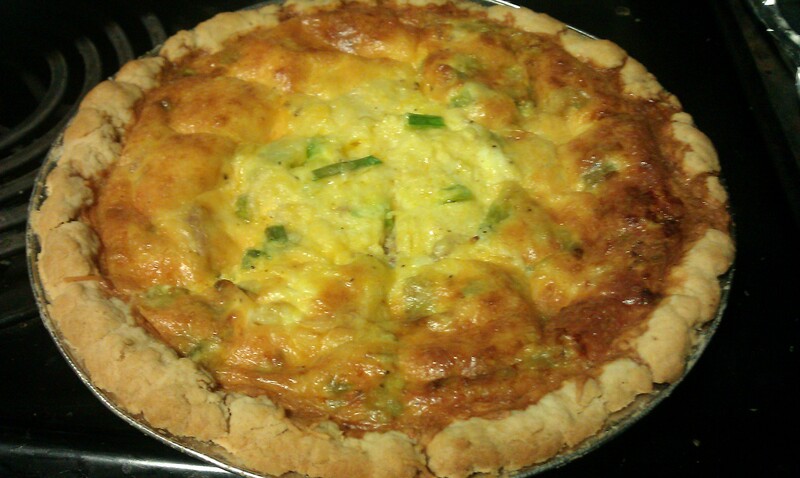 Let quiche stand about 5 minutes before cutting.